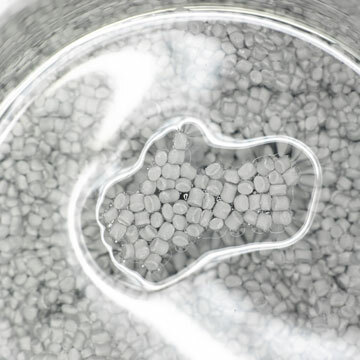 Wandaa Moisture absorbers have been developed to prevent the fish eye effect in film blowing as well as to prevent bubbles and porosity during the manufacturing process. Moisture, which is present in all recycled materials, especially PE films, will be absorbed and the calcium oxide will change to calcium hydroxide after reaction with the moisture absorber. This reaction will happen during the extrusion process. As an additional advantage, our additives help to decrease the formation of nitrosamines. 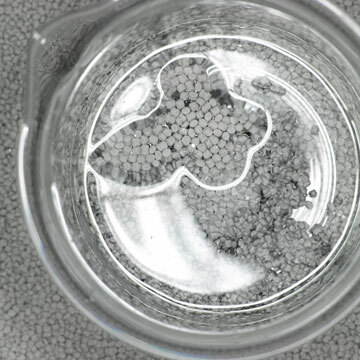 Our moisture absorbers are inactive during mixing but then react quicker than other calcium oxide preparations, permitting shorter standing time between mixing and extrusion. In comparison to CaO preparations in powder form, which react during the mixing process, our additives show clear advantages due to their desensitized form. The most important point is that the dosage may be considerably reduced; therefore, the influence of CaO on the physical properties of the compound is minimized. The granules have a special formulation so that the use and dispersion even in very thin films will be quick and without any problems. Easy dispersion will take place immediately after the addition to the compound. Special 5 kg vacuum bags packing for easy handling and a long storage stability.